We are taught from a young age to do our best in school and try to excel above the crowd. This is hard for some, but it comes naturally for others. It would seem to be common sense that those who are ahead of the pace get an equitable reward for their efforts or talents. That reward was finally recognized by the state legislature last month. 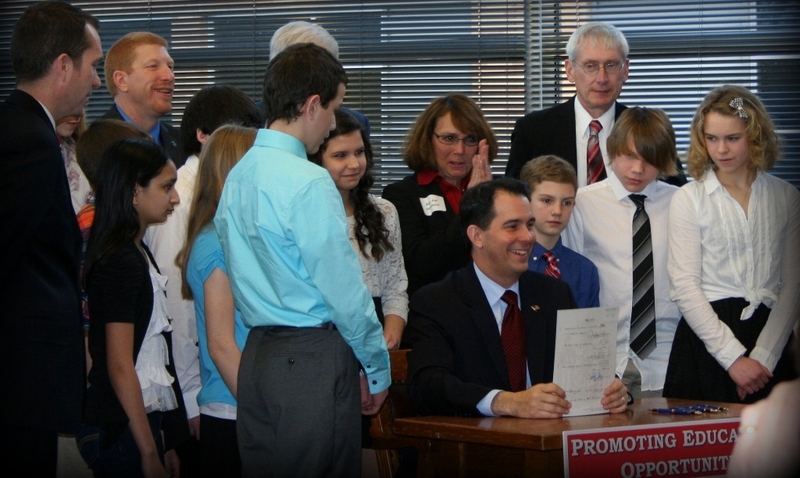 Governor Scott Walker signed a bill March 14 at Badger Middle School that grants seventh and eighth graders high school credit for high school courses that they take. The signing was attended by lawmakers, the school board, teachers, and about 40 students that will benefit from this. Since numerous middle school students already take such classes, this new law serves a valuable purpose. “We went out and we talked to the different people, the head of the education committee, we asked them what they felt about this idea. Everybody thought it was a positive thing,” said state representative Pat Strachota at the signing. Complete accordance isn’t something you hear often in government, but our state legislature had very good reasons to pass this bill. By receiving additional credit before high school, students could graduate with a greater number of credits in the subject they plan on going to college for. This will enhance college applications, and it also has the potential to land a student more scholarship money, since it would be apparent that the student was focused and driven. The new legislation could also free up more room in a student’s schedule for electives. Maybe someone is great at math, but his or her career has nothing to do with the subject. Instead of taking up four year-long class periods to fulfill math requirements, some of the credits could be accounted for before the student enters high school, leaving more time to focus on a different subject or try new electives. The West Bend School District played a significant role in lobbying for the bill, and our own district representative and senator were its authors. Superintendent Ted Neitzke hopes that the district will soon be able to offer a wider variety of basic high school courses at the middle school level. This is an excellent opportunity to get ahead for students who are able to or need a greater challenge. I personally would have been positively affected by this. Upon my first few guidance counselor visits, I asked why I didn’t receive credit for algebra when I took it as a seventh grader, but my classmates, now two years later as freshman, did get credit. Something just seemed wrong with a more advanced student getting less in return for doing the same work at a younger age, than a student at the normal pace gets. Once again we are focused on the extrinsic rewards of education and forget what the true purpose of learning should be…If our “top students” are motivated by the grade and credit, they will be just a simple product of the institution of public education. Fill in the bubble.